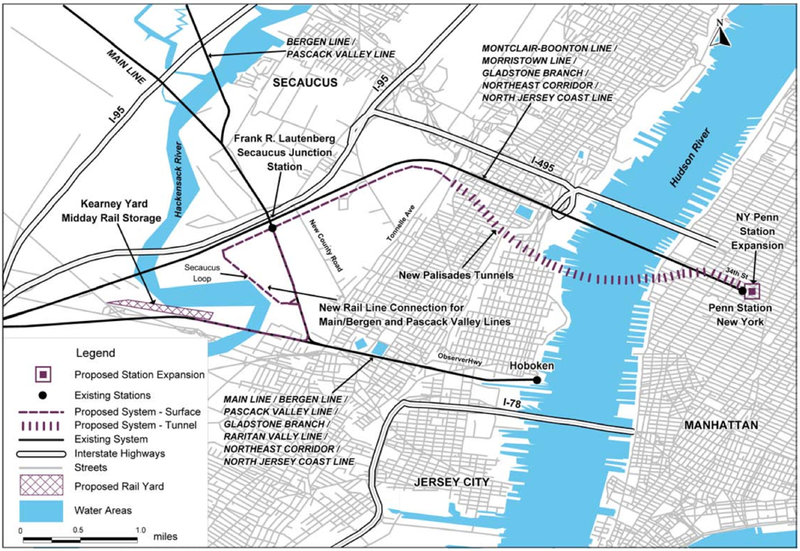 Access to the Region’s Core (ARC), which was officially abandoned in 2010, consisted of similar transportation elements as the Gateway Project, but with additional features such as a new Manhattan rail link for Main Line, Bergen County Line, and Pascack Valley Line trains, and a new Kearney Rail Yard for midday rail storage. The ARC improvements included 9.3 miles of new trackage (3.7 miles of new tunnel) and a new six-track, deep cavern station below 34th Street in between 8th and 6th Avenues. The estimated total cost of the project was $8.7 billion with an estimated completion year of 2018. In terms of division of funding, the federal New Starts Program would have provided $3.0 billion, or the equivalent of 34.5% of total funding. 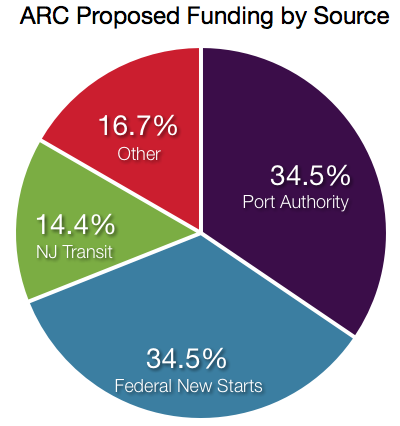 The Port Authority would have also contributed $3.0 billion. The State of New Jersey would have provided $1.3 billion, or the equivalent of 14.4% of total funding. Lastly, other federal funding, including the Congestion Mitigation and Air Quality Improvement Program and the National Highway System, would have provided approximately $1.4 billion, or the equivalent of 16.7% of total funding. 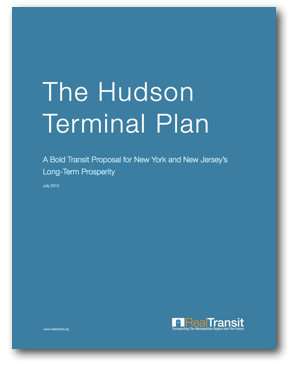 Similar to the Gateway Project, ARC suffered from numerous deficiencies, the most notable being the lack of significant improvements in both cross-Hudson and Manhattan train capacity. However, whereas the Gateway Project incorporated its new tunnels into existing Penn Station trackage, the ARC tunnels would have been completely independent from existing trackage, i.e., there would be no way to transfer between the ARC tunnels and Penn Station or the North River Tunnels and New Penn Station Expansion. Further, the New Penn Station Expansion below 34th Street suffered from the same design deficiencies as the current Penn Station. It would have had no open air space and no central concourse linking all of the station’s tracks. 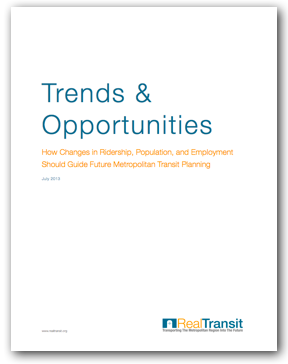 In fact, the proposed station expansion would have descended over 150 feet below street level, making it one of the deepest transit stations within New York City and one of the most difficult to access from street-level. However, due to the thin design of the station cavern, it would not require the demolition of private property as is required under the Gateway Project. 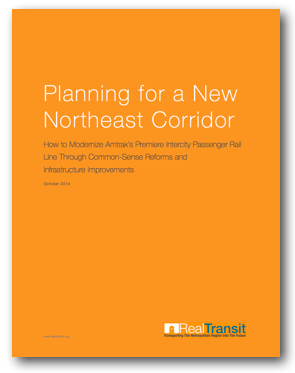 Overall, ARC would have provided key benefits to the region such as connecting all of NJ Transit’s lines to a Manhattan rail link, doubling cross-Hudson hourly train capacity, and connecting Penn Station to the BMT Broadway and IND 6th Avenue subway lines. All of this would have been accomplished at nearly half the cost of the Gateway Project’s $14.5 billion price tag. However, much like the Gateway Project, the ARC project did not go far enough to create a long-term solution to the challenges associated with the region’s growing demand for rail travel.